Copies rates data to the RateInfo two-dimensional array of double type and returns the amount of bars copied. [out] Destination array of MqlRates type. [out] Two-dimensional destination array of double type. The function returns copied bars amount, or -1 if failed. 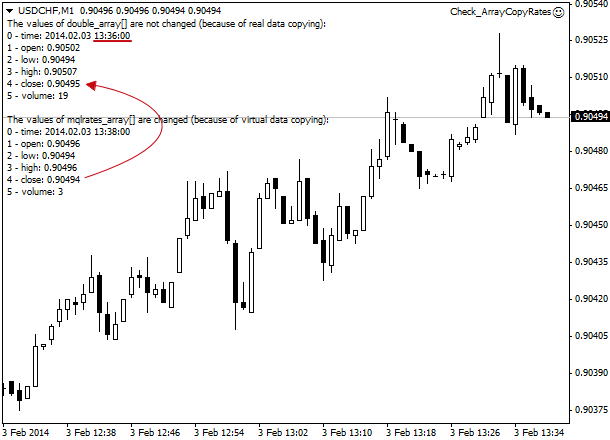 If data (symbol name and/or timeframe differ from the current ones) are requested from another chart, the situation is possible that the corresponding chart was not opened in the client terminal and the necessary data must be requested from the server. In this case, error ERR_HISTORY_WILL_UPDATED (4066 - the requested history data are under updating) will be placed in the last_error variable, and one will has to re-request (see example of ArrayCopySeries()). This rates array is normally used to pass data to a DLL function. In the first variant of the function it performs the virtual data copying to the array of MqlRates type. It means that if timeseries data has been updated, rates_array array always will refer to the actual data. In the second variant it performs the real data copying to dest_array array. The destination array will be resized to the size of the timeseries (even if the destination array has been declared as static). #property copyright "Copyright © 2013, MetaQuotes Software Corp."
#property description "Expert Advisor displaying two cases of"
#property description "ArrayCopyRates() function call"